Will someone please explain to me how it would be a good idea to not only defund an advanced course of education in a public school system, but ban it entirely with the asinine idea to replace the curriculum with a “sanitized version of American History” in order to create “American Exceptionalism”? Banning AP History in Oklahoma for any reason is ludicrous. I understand that there is once again a shortfall of money for the budget. This is nothing new, and as long as the imbeciles that we have running things continue to overspend it will never end. But why is it that the ones to suffer are always the working or working poor class? Because you and I know, that not one single Senator or Congressman/woman has a child that goes to public school (so their kids education will remain top notch in private schools). The worries from the teachers in Oklahoma are very valid- If this bill comes to pass, will they only be able to teach a “sanitized version” of U.S. History? Possible removal or “white washing” (Hah! Pun not intended) huge parts of our history like the Trail of Tears, The Tulsa Race Riot of 1921 and the American Slave Trade in the misguided hopes that young Americans will buy into the “America is perfect and always has been” thought process? Do they not understand that kids today also have the internet? Or the History Channel? What are they trying to do, Kim Jong-un the Oklahomans? If they are successful with this bill, will they take it to the federal level? SHUDDER. Don’t get me wrong, I love my country. I love almost everything about it (The almost means I am looking at you Big Government). However, I also know her history and flaws- and love her not despite it- but because of it. It is our pasts, checkered, flawed and imperfect that make us who we are. The ability to acknowledge what we have done that was wrong is the ability to try to right those wrongs and become better people because of it. If mistakes, tragedies and horrors are not acknowledged in our history, how can we ever hope to evolve as a nation? If a mistake is not admitted it cannot be learned from. It is fundamentally impossible to learn from a mistake if one does not admit/believe a mistake was made. With all of that being said, I think that the representative that is bringing this bill forward deserves a swift kick in the nuts (House Bill 1380 brought to you by Rep. Daniel Fisher). Oklahoma’s legislative committee on education needs to go back to school, because they are behaving in an arrogant and ignorant way by voting to pass this bill, because “the courses are not patriotic enough”. Idiocracy. It’s happening people. Every day we get that much closer. What are your thoughts? Opinions? 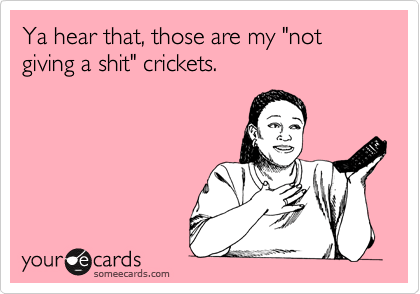 Crickets?